Here’s how I go about a simple chroma key (green screen) composite. Each compositing program has different terms for the processes and tools I’m going to talk about. Therefore, this is meant to be a general overview, not a program specific tutorial. So, don’t ask me how to do “such and such” with program “X”, because I don’t know how and your program may not even be able to do it. A good program will allow you to view the matte (or Alpha Channel as it’s sometimes called). It’s often easier to spot problems with the matte if you are able to view it directly. Even if your program doesn’t allow you to see it, it’s still generating a matte internally. We start with two images: a background (BG) image and a foreground image (FG). The FG is placed in front of the BG. At this point, the FG completely hides the BG, because we have not made a matte for the FG yet. Chroma keying is a method of creating a matte from a specific colour (in this case the green screen). First we tell the computer which colour we want to make transparent (allowing us to see the background through it). The green screen is never perfectly lit, so some tolerance ranges have to be adjusted to let more of the green become transparent. You can see here what happens if the tolerances aren’t set right. Parts you want to keep start going transparent. Keep tweaking the settings until you get the best possible result. Don’t worry if there is still a green outline around the FG subject (it’s bound to happen 99% of the time). There are other tools that will take care of this. First of all, if you don’t know anything about colour space, you may want to check THIS out. Most low end compositing programs work in RGB (red, green, blue) colour space. Unfortunately, in my experience, this is the worse colour space to work in. Why? Think of it this way; The three controls you have over the key are Red, Green and Blue. Assuming you’ve shot a perfectly lit and exposed green screen (even though this never happens! 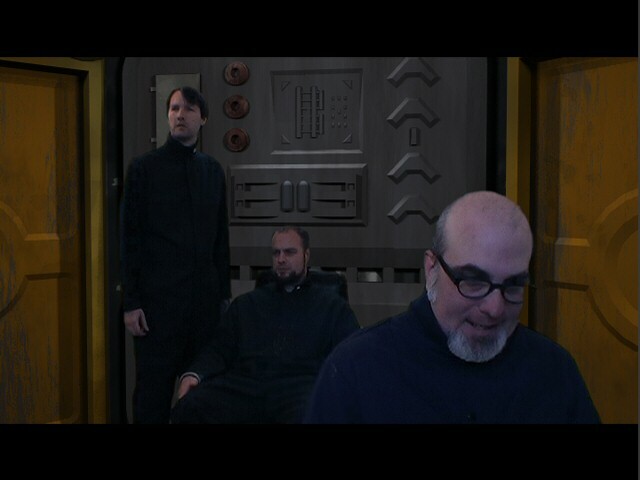 ), then what good are the Red and Blue controls on your chroma key? Basically, two thirds of the controls don’t help you refine your key. Now think of the same thing in HLS (Hue, Luminance, Saturation) colour space. Once you pick the colour (Hue) of the key, in this case green, you can then hone in on the luminance of that green AND the saturation of that green. Now all three of your controls are helping you refine the key. If you’re working with MiniDV footage, then it makes even more sense to work in YUV, as that is the native colour space of that format. If your compositing program allows it, work in any other colour space than RGB. If you’re stuck with RGB, it’s sometimes better to colour correct your green screen footage before you try to pull a key off it. This may make your subject look awful, but puts the green of your screen more in the “zone” your keyer likes. You then have to take the matte this generates and apply it to an uncolour corrected version of the FG. This is more complicated, but can produce much better results. Shrinking (or choking) the matte does what it sounds like. It makes the matte smaller and will help remove green outlines. The catch is, the more you shrink the matte, the more fine details are lost (such as strands of hair). If you go too far, people can lose their hands or even their heads! A good program will allow you to adjust the gamma, erosion, blur, histogram, etc. of the matte as well. Next we have to deal with something called Spill. 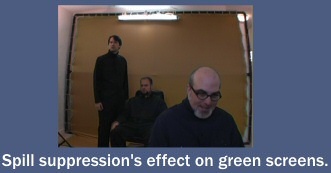 That’s when light reflected off the green screen falls onto your subject, turning it green. This is why it’s important to keep your subject as far away from the green screen as possible. The farther away they are, the less spill will hit them. You can see below how the actor’s skin is reflecting some green. The way to get rid of it is to use Spill Suppression. Most el cheap-o compositing programs don’t have this tool. Too bad, ’cause it makes your composites look a lot better. It basically allows you to colour correct just the green. You can see what it does here. I’ve not only suppressed the green, I’ve also swung it towards flesh tone, because I was most concerned about what it was doing to peoples’ faces. Wispy hair is something else that benefits greatly from Spill Suppression. So, we’re almost done. All we have to do is get rid off all that crap outside of the green screen. This is accomplished with a Garbage Matte. Here I have created the garbage matte using a roto spline (a hand drawn shape). When it’s turned on, everything outside the shape becomes transparent regardless of what my chroma key says. Some programs may refer to this as a Mask. A colour correction has been applied to the foreground to make it better match the BG environment. A letterbox has also been applied. I like to shoot full frame and then add the letterbox in post. When working with virtual sets it can be hard to know at the time you’re shooting if you have the shot lined up exactly right. Having extra image outside the letterbox allows me to adjust the composition. In this case, I actually moved the shot up a bit to reduce some of the headroom. The letterbox then hides the gap left at the bottom of the frame. There, all done! However… Just because a still image looks good, doesn’t mean the moving footage will be acceptable. MiniDV has a lot of compression and this can cause noise (or bubbling) on the edge of your mattes. This is often not apparent until you see the footage in motion. If you have noise in your matte, go back and tweak all the settings until it goes away. Shrinking or choking the matte helps, but remember if you go too far, people start losing their body parts! Sometimes applying a blur to the shot before the key is pulled will help. But of course, you will then have a blurred shot. Use the matte pulled from the blurred shot, but apply it to a non-blurred version. Let’s start with the basics of how an image is captured. It’s all about the exposure. The first picture is under exposed. The second picture is over exposed. But the third picture is just right. (Pictures courtesy of Goldilocks). 1) The aperture, AKA the opening in the iris. 3) The sensitivity of the imaging device. The larger the aperture the more light comes into the camera. The longer the shutter is open, the longer light is allowed to fall onto the imaging device. The less sensitive the imaging device is to light the more light it needs to make a good image. Apertures in film and video cameras work the same way. With motion picture cameras, the shutter is a metal half-circle that spins just in front of the film. When the shutter is out of the way, the film is being exposed. When the shutter is blocking light from falling on the film, the film is being advanced to the next frame. Most of the time, motion picture cameras have a shutter speed of 1/48 of a second. With video cameras… Okay, are you ready for this? I’m going to blow your mind. Despite the fact that video cameras have a feature you can set called “shutter speed”, THERE IS NO SHUTTER IN A VIDEO CAMERA! …Have you recovered from that yet? Film cameras have shutters because the film needs to be advanced to the next frame. If there was no shutter, the film would be exposed while it’s moving to the next frame, causing nasty vertical streaks. Video cameras use CCDs. When light hits the CCD it begins to build an electric charge. The longer light is allowed to hit the CCD the larger the charge becomes. Also, the more intense the light the faster the charge builds. When the CCD is discharged, the image is captured and the CCD returns to zero charge. The process repeats. Normally, an NTSC video camera has a “shutter speed” of 1/60 of a second (PAL is 1/50). That means the CCD is discharged after 1/60 of a second. If the “shutter speed” is 1/1000, that means the charge on the CCD is only allowed to build for 1/1000 of a second before it’s discharged. Obviously, the shorter the time a charge is allowed to build the smaller that charge will be, resulting in a darker image. This has the same affect as shutter speeds have with film, but it does it without a physical shutter. Okay… That’s a bad choice of words to describe how film cameras work, because they don’t use an imaging device, they use… well, er, film. However, the sensitivity can change depending on the particular film stock used. The sensitivity of film to light is expressed in the ASA number and referred to as the “speed”. The “faster” a film stock is (or the higher the ASA number) the less light it needs to capture a good image. The trade off is that fast film is more grainy. Most movies use 250 ASA film for daytime scenes and 500 ASA for nighttime and indoor scenes. The sensitivity of a CCD depends on it’s engineering. Some video cameras use three CCDs and as a result need more light (but have better colour reproduction). Video cameras have a feature called “Gain”. This boosts the video signal to make it look brighter, but does so at the expense of making the image more grainy. It’s very much the same effect as using a faster film stock. In most cases it’s better to add more light to a scene rather than increasing the gain.